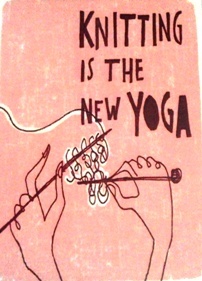 Knitting is the new yoga is a phrase often heard amongst knitters, and we like to point out that we accomplish things at the same time. As a yoga student, it has the meditative properties, but my abs and triceps benefit little from my knitting, try as I might. Today I was watching a talk show and they were taking about Transcendental Meditation and the associated health benefits. I was working on my current shawl, at a point in the middle of each row, where it is mindless stockinette stitch, and thought this is TM also. A quick google turned up this yoga retreat site that taught knitting as a meditative part of the retreat. Knitting relieves stress for me, and comes out in times of crisis to keep me centered. It always is my solution for people going through difficult times in their lives, whether they be personal or physical. Some heed my advise, most look at me as if I were crazy. 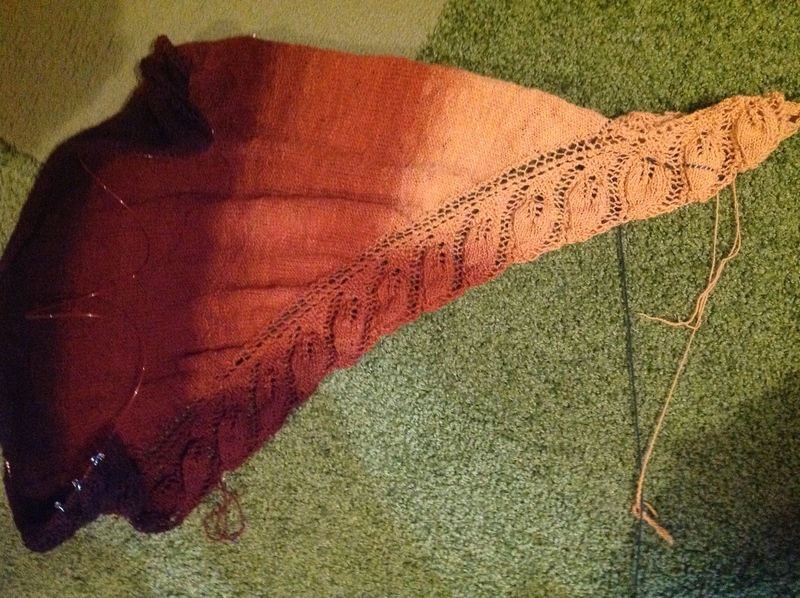 This is my current shawl, Semele. I have added extra increases to make it a true shawl, you all know my less than passionate feelings towards “shawlettes”. Seems like any “ettes” are simply excuses for not having the completed full thing. The other rational was to use all of the yarn that I have, this is a handspun gradient from Fiber Optic, Honey to Fig. 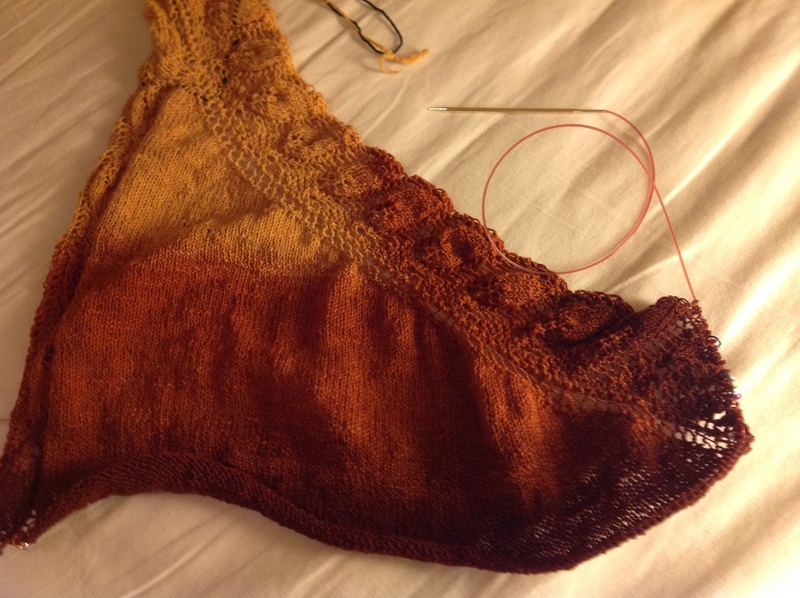 There were many false starts to this shawl, as I was determined that this gradient wanted to go side to side. This pattern was perfect, as you knit increasing until you have used almost 1/2 the yarn, then start decreasing. I might have pushed the envelope a bit on this one, but I do have a back-up plan in my head if I run out of yarn at the end. 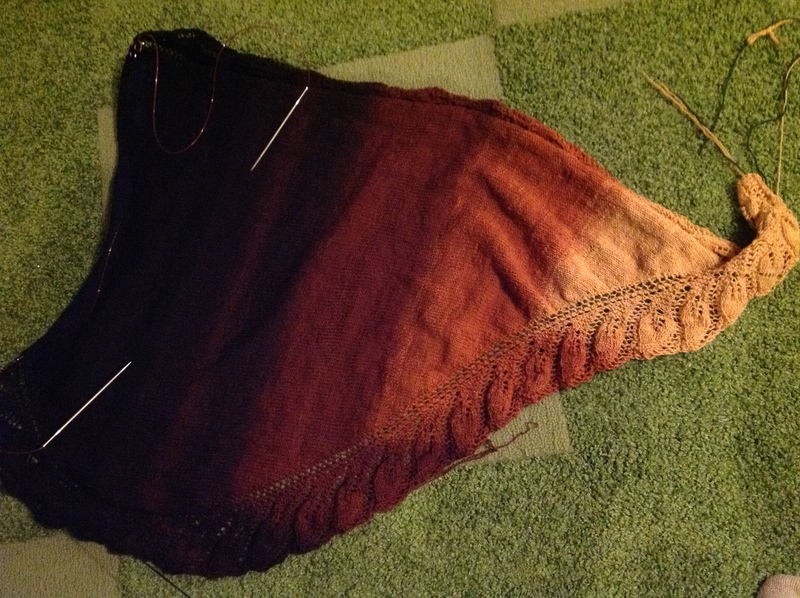 Here is my progress, I am approaching the end quickly, having knit the majority of the body. I was in a fog, took me quite awhile to get the hang of the pattern repeat. And the cast-on befuddled me, as the first leaf is backwards, I kept thinking that I had made a mistake. It is advisable to read all the directions for a pattern first prior to starting to knit! Thank you! Better lighting and blocking will show it off more. I am anxious to get to the purple colors. I agree with you about shawlettes. If I want something to make it is going to have a purpose more than cute. Mine is to keep my shoulders and neck warm summer and winter. And they all look lovely than. What a pain sometimes to i figure out the increases, but so worth it in the end. My shawls become scarves in the winter, a quick pull over in a cold restaurant, and something light on a cool summer evening. Shawlettes just dont cover all that. 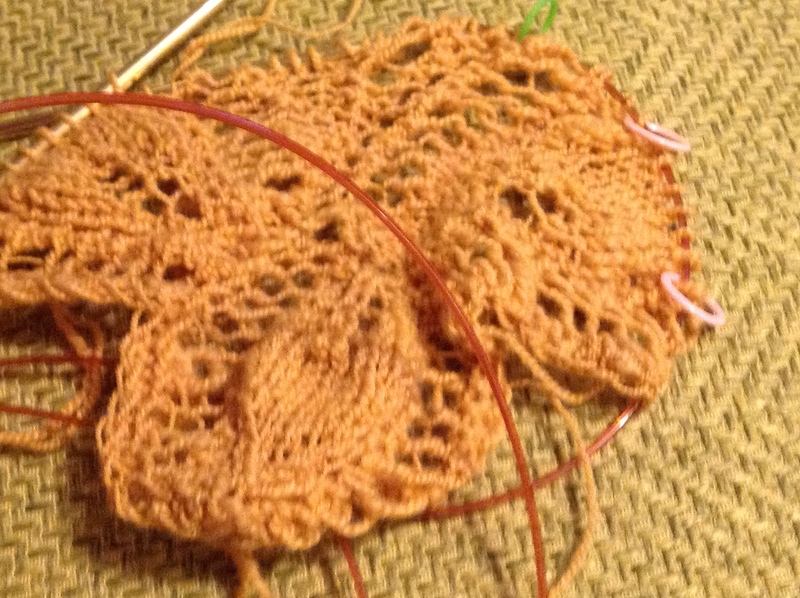 The increases were easy to figure out with this pattern, I will elaborate on Ravelry and in my last post. Thanks! Aww…I just posted about my love for shawlettes 😉 They aren’t so bad. I do love that gradient yarn though, and the effect you’re getting along the edge, it’s beautiful. Sorry, not meaning to offend, I just like a big shawl to wrap around me. What a great post and a beautiful shawl.